Vancouver Island's Pacific Rim region has a long history of fishing, along with a bright future that holds much optimism through diversity in the growing recreational industry. For the small coastal community of Tofino, fishing has always been a major attraction, with fish and seafood stocks creating the backbone for their growth many years ago. These rich aquatic resources continue to attract Sport Fishermen from all over the world, with this season showing as much popularity as ever. Angling in Tofino, on the west coast of Vancouver Island this year holds a lot of promise for great opportunities. With new diverse fisheries being developed, such as the rapid growth of Saltwater fly-fishing in the area, some very unique freshwater fishing options and the increase of bottom-fishing along our near shore banks, these only compliment the existing terminal fisheries that have attracted many over the years. With all angling options combined, along with the continued advancement of accommodations, culinary services and other recreational opportunities, Tofino and Clayoquot Sound continue to shine as one of British Columbia's premier destinations. The small to medium sized river systems in the area hold stable runs of native steelhead averaging 6-12 lbs. This season has seen a good return as usual with very little fishing pressure on these remote river systems. Peaking in late March through May, these spring-run Steelhead will readily take flies, spoons and terminal gear. Expect excellent action for Chinook Salmon and Halibut among the baitfish rich banks offshore from Tofino. Fishing at Tofino's Portland or Raphael pts. in 140-160 ft. of water, will continue to produce Chinook Salmon over 30 lbs., and Halibut averaging 20-60 lbs. Anticipated to be significantly better than last season, this combination fishery continues to provide great action through late September. 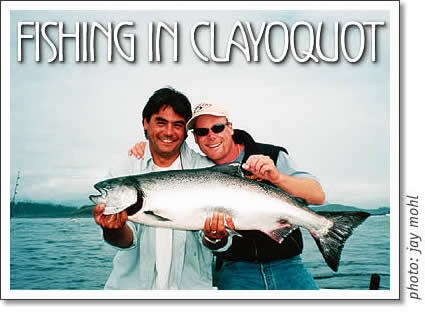 Tofino sportsfishing guide Jay Mohl writes about Tofino fishing in Clayoquot Sound on Vancouver Island for chinook, salmon and halibut.